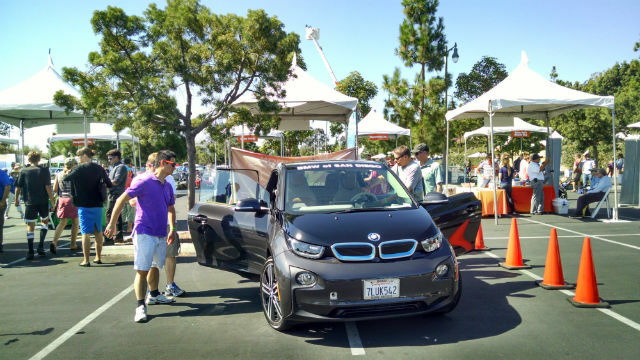 More than a thousand San Diegans crowded into Liberty Station Saturday to inspect and test drive the latest EVs on the third annual Electric Vehicle Day. City councilman Mark Kersey was one of the officials on hand to welcome the crowd and talk up the benefits of driving electric vehicles. Kersey traded in a BMW 3 series for a Tesla eight months ago and said he appreciates both the technology and the convenience. He spoke as vehicles supplied by local dealers quietly drove by under electric power and people patiently waited in line for their turn at the wheel. Sponsors San Diego Gas & Electric, the Center for Sustainable Energy and Cleantech San Diego are encouraging San Diegans to meet Gov. Jerry Brown’s goal of 1.5 million electric vehicles on the state’s roads by 2025. There are already over 18,000 registered in San Diego County alone. “Our customers are already telling us that they want electric vehicles,” said April Bulduc, plug-in electric vehicle program manager for SDG&E.